How do you begin learning a foreign language? What are resources that language learners use? What can you gain from learning a new language? 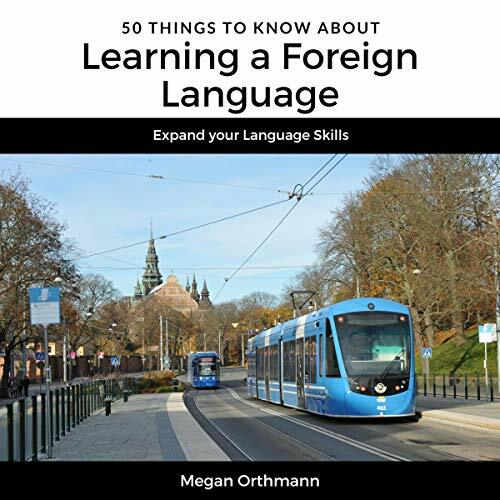 50 Things to Know About Learning a Foreign Language by Megan Orthmann offers an approach to learning any foreign language with tips and tricks to succeed. Most books on language learning tell you to take formal classes, study verb charts, and spend years memorizing verb lists. Although there's nothing wrong with those approaches, there is never a single way to learn a new skill. Learning a language is much easier and more relaxed than it appears. Many people believe that in order to learn any language you must be just “good at learning languages.” So many people believe they are not someone with this natural ability. Everyone, no matter your strengths, weaknesses, age, or financial situation, can learn a language. Here you'll discover language learning methods, helpful advice, and everything you need to know about the learning process. This book will help you to begin your journey by picking a language you will enjoy, teach you how to gain confidence and skills, and use the language to your best ability with native and experienced speakers. There is more to language learning than memorizing words and verbs; see for yourself how much perspective learning a new language can give you. By the time you finish this book, you will know how to begin learning any languages and the mental and physical tools to do it! So, grab your copy today. You'll be glad you did.